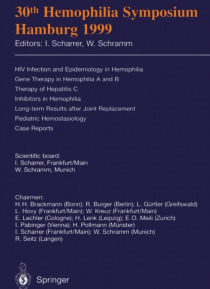 This book contains the contributions to the 30th Hemophilia Symposium, 1999. The main topics are HIV infection, inhibitors in hemophilia, modern treatment of hemophilia, drug-induced thrombophilia and pediatric hemostasiology. The volume is rounded off by numerous free papers and posters on hemophilia and associated topics.